The AN/APG-63 is an operating in X-Band multimode radar installed in the USAF F-15A/B and early F-15C/D supersonic fighter aircraft. It is a pulse Doppler system that operates over a number of selectable frequencies. The transmitter uses a Traveling Wave Tube. The antenna is a mechanically moved planar-array of slotted waveguides, carried on a three-axis gimbal system. The AN/APG-63 was the first airborne radar system to incorporate software programmable signal processor. The AN/APG-63(V)1 is an upgraded variant of baseline APG-63 radar, used in the F-15C/D aircraft. A modified version, the AN/APG-70, superseded the AN/APG-63 on the F-15E “Strike Eagle”, but was then itself to be replaced with the AN/APG-63(V)1, as part of a comprehensive AN/APG-63 upgrade. The AN/APG-63(V)1 upgrade improves reliability and maintainability through replacement of some radar parts with new hardware. The AN/APG-63(V)2 is a major radar upgrade for the US Air Force F-15C aircraft. 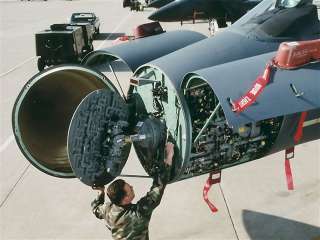 This version uses an active electronically scanned array (AESA) in connection with the proven AN/APG-63 radar electronic. The successor version AN/APG-63(V)3 uses the electronic improvements in the AN/APG-63(V)2 and the antenna of the AN/APG-79. The AN/APG-63 has been operational since 1973. The AN/APG-63 is no longer in production but remains in service.